Chest Pain: How Sure Are We at Predicting? Here’s a scary problem …. If I was a paramedic, not an emergency physician with all my resus cubicles, serial troponins and all the serum rhubarbs I could order and I was called out to see someone with chest pain, who would I take to the ED and who would I leave? The answer is probably, everyone with chest pain would get taken to the ED. Let’s take a look at adults first. Our role in all patients is to risk stratify. We know that in the Emergency Department we miss about 2% of AMI (NEJM 2000) and about 2% of UAP (unstable angina pectoris). Are there some aspects of the patient’s presentation that can assist us? Certainly our gestalt becomes important. However, how sure are we really? In a 2004 study in the Annals of Emergency Medicine (2004: 44; 565-574) Chadwick et al looked at 2922 patients where the initial impression was “non-cardiac chest pain”. Although the study had some limitations including that 8% of the patients were not followed up, it was important that in 93% of cases we were able to predict that there were no cardiac issues. This is pretty good. HOWEVER, what was of greatest interest to me, was that in 53.2% of patients labelled as having non-cardiac chest pain cardiac markers were done. Because we just aren’t sure! The other thing that seemed to come out in this and other studies (Pope NEJM April 20th, 2000) have found that shortness of breath is very important in diabetic patients and in the elderly. Also, lethargy in the elderly is seen as very significant, correlating highly with predicting those patients with a cardiac event. WHAT ABOUT THE LOCATION AND RADIATION OF THE PAIN? Firstly, let’s talk about an “Angor Animi” This is the feeling that the patient has, of impending doom. If a patient tells you they feel like they are going to die, they’re probably right. Take it seriously. 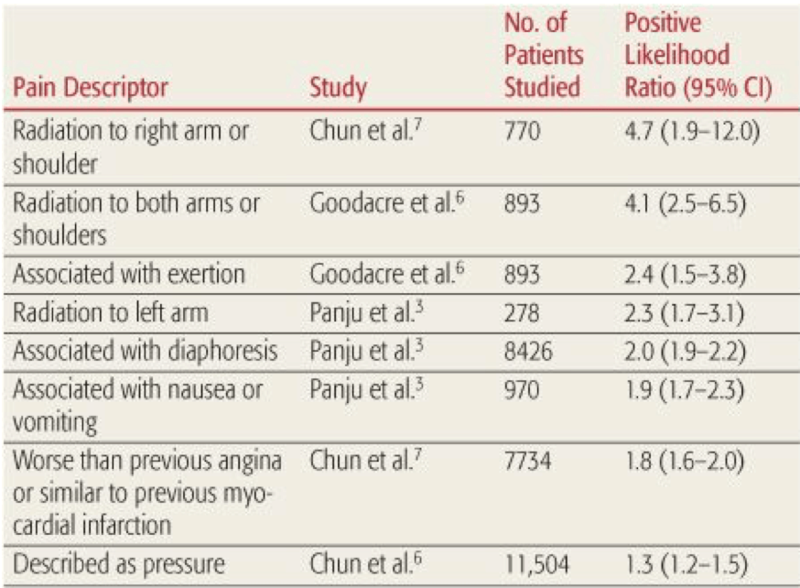 In terms of other characteristics of pain and their radiation and the relation of each to likelihood ratios for predicting AMI, some will surprise you. The table below shows likelihood ratios for predicting of AMI. It is important to take from this table that Right Arm pain or both arm pain, is worst than Left arm pain. Symptoms such as nausea and vomiting and diaphoresis are also worth noting. Just like these are signs and symptoms of high likelihood ratios there are those shown below, that predict a lower ratio and thus a lower likelihood of ischemia. We know that up to 50% of patients presenting with an AMI may have a normal ECG on presentation. Serial ECG’s are therefore imperative. On its own, a normal ECG, predicts a lower risk of complications. AMI presents in 80% of patients with ST elevation greater than 1mm and in 20% of patients, with an ST depression or T wave inversion. If there are no ECG changes and the patient has a history of acute coronary syndrome, the risk of AMI is about 4% as compared to 2% if there is no previous history (NEJM April 20th, 2000). So we can say that the ECG is very important in investigating patients with chest pain. In fact it is as important as all other information combined ….. EXCEPT ….. when it is normal. HOW ABOUT THE PATIENT WITH REFLUX? About 15% of patients with AMI get some relief from Mylanta/Xylocaine mixture and 7% get total relief. WHY DO WE MISDIAGNOSE CHEST PAIN AS REFLUX? There is a high risk of gastro oesophageal reflux disease in patients with coronary artery disease. About 50% of AMI’s have increased belching with pain. WHAT IF I GIVE GTN AND THE PAIN GOES AWAY? medication can work on oesophageal spasm as well. However, if it goes away you have to think about a cardiac diagnosis because it would be just wrong not to. HOW ABOUT KIDS WITH CHEST PAIN? Kids are very different to adults. I’ll be talking about this in EMCORE 2015. They don’t have the risk factors that adults have ie. alcohol intake, smoking, cholesterol. In most cases the cause of the chest pain is idiopathic or musculoskeletal or they are associated with some kind of stressor. The most common stressor in kids is that whatever occurs at school. In younger children with no history, there don’t tend to be any issues at all. In older children however there are some risks that start to creep in. Certainly we need to think about pulmonary embolism as it still occurs in older children especially female patients that may be on the oral contraceptive pill at an early age, or are congenitally more predisposed to it. Beware of the child with Sickle Cell Disease. In 50% of cases they get an acute chest syndrome. However, this is also associated with fever and coughs and pulmonary infiltrates, not just chest pain. Beware atypical chest pain as it may in fact be a typical presentation and we just don’t know about it yet. Never trust chest pain especially in the elderly and beware the elderly with shortness of breath or those complaining of lethargy. Also beware of the diabetic patient as chest pain can present very atypically. Remember EMCORE 2015- 44 Lectures in 2 days. See you there!